Hip bursitis is a painful inflammation of the hip bursa. The bursa is the fluid filled sac that sits on the side of the hips and allows smooth gliding of the tendons. The main symptom of hip bursitis is pain located on the outside of the hip, often making it difficult to lie on the side or to stand on one leg. Hip bursitis is often a result of, or is exacerbated by, leg length asymmetry, foot weakness / over-pronation, or weakness of the hip and trunk stabilisers. Most cases of hip bursitis can be successfully treated with conservative care including manipulation, soft tissue work and strengthening. Hip impingement occurs when the ball-and-socket joint of the hip changes shape causing friction, pinching or decreased motion. Friction may cause damage to the joint cartilage (the white covering over the bony surfaces that allows smooth gliding) or to the labrum (a fibrous cartilage that lines the outer edge of the socket). Long-term this can result in labral tearing and/or hip arthritis. “Cam” impingement describes a “bump” on the surface of the femoral head (the “ball” of the joint) which causes it to collide with the rim of the hip socket. This typically affects younger male athletes. “Pincer” impingement describes a socket that is deeper than usual which restricts the movement of the femoral head. This more commonly affects middle aged women. “Mixed” impingement – describes a combination of “Cam” and “Pincer” impingements. Hip impingement is common in athletes and other active individuals. It usually presents with hip pain or pain in the groin which becomes worse after activity or periods of prolonged sitting. It may also be associated with a clicking in the joint. Mild hip impingement can generally be successfully treated with a combination of manual therapy and corrective exercise. Unresolved or severe hip impingement may require surgery. 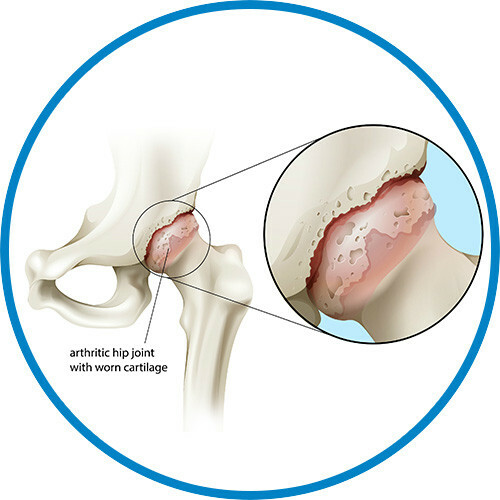 Hip arthritis (osteoarthritis) is a very common in older populations and results from a progressive breakdown of the protective cartilage in the joint. This leads to hip pain, groin pain (sometimes referring down the leg), loss of hip motion and, in more severe cases, difficulty walking. Traditionally, hip arthritis has been considered a “wear and tear” disease process. It was thought to develop solely due to increased strain on the hip joint from some form of trauma (e.g. a car accident) or daily micro-injury from poor mechanics or over-use. However, more recent research suggests that this may not be the complete picture. New evidence is showing that hip arthritis is not the same disease process in every case and many other factors are involved. Inflammation, obesity, nutrition, hormone imbalance and autoimmunity have been shown to play a role in certain patients with hip arthritis. Treatment of hip arthritis should include manual techniques and strengthening, alongside the management of any underlying causes. Hip pain is not always a result of a hip problem. Commonly, muscles, joints or nerves in the spine can cause pain to be felt at the front, back or side of the hip. Knee injury can also cause hip pain in some cases. This is called ‘referred pain’. Referred pain can mimic various local hip problems and in many cases it is difficult for the patient to determine where the pain is actually coming from. A thorough examination is therefore essential so that the true origin of pain can be established and effectively addressed. Faulty movement patterns. Faulty or compensated movement can lead to greater strain on the tendons. By addressing dysfunctional movement, strain on the tendon can be reduced and pain improved. Other factors, such as nutrition, have also been shown to play a role in tendon injuries. Diets that are high in simple sugars and refined oils and low in fruit and vegetables reduce tendon resilience. Looking for Hip Pain Relief? Click here to find out how Treatment at Dynamic Health could help. 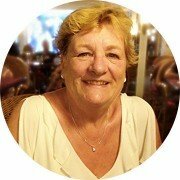 “The stiffness I regularly experienced in my hips has improved considerably and I can now sleep without being woken by lower back pain and stiffness. “I was recommended to see Katie by my daughter I as had pain in my knee which affected my mobility. After several sessions the pain in my knee had gone completely & I was able to walk down a steep step without holding on to somebody, which I had struggled with before treatment.